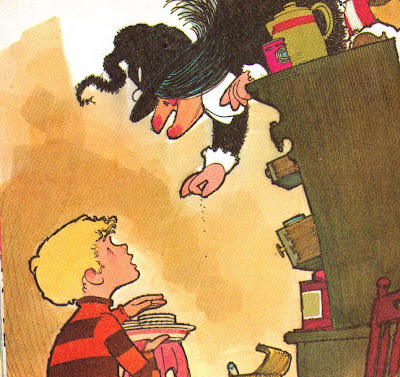 Though the stories in the Devlin books are a little vague and underwritten, I have to admit, nothing screams growing up in the 70s like the matching nose/chin action of the stout Old Witch. Thus why her books are often the most talked about and collected of the era. The art is cool and iconic, and the main character mischievous and fun loving. Nicky's mother carefully explained about the contest. Oldwick needed a new bandstand and the townspeople agreed that a carnival, with a cake baking contest, would be a fine way to raise money. "A new bandstand!" Old Witch screeched, "What's wrong with the old one? It's got everything--spiders, mice cobwebs and bats." 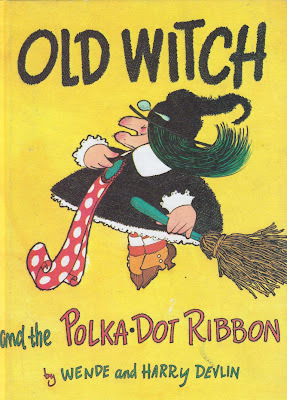 Regardless, Old Witch gets cooking, discovers a cheater in the midst and makes all that is wrong right again before she snags a polka dot ribbon for most original recipe. Really, since she first fell down the chimney and into our hearts in 1963, she's been haunting Generation X-ers with her upbeat anxiety and black soul full of love. She speaks for all of us in that she is anxious, competitive and a little bit rascally, but still has warmth in her heart. She's everybody's alter-ego, bless her. I'm gearing up this weekend to try the recipe on the back cover. Children's book as dessert revelation? I'm down with that. You can never go wrong with a witch story can you? My daughter loves them all! I love Wende and Harry Devlin books! Did you ever find Liza Lou and the Yeller Belly Swamp? 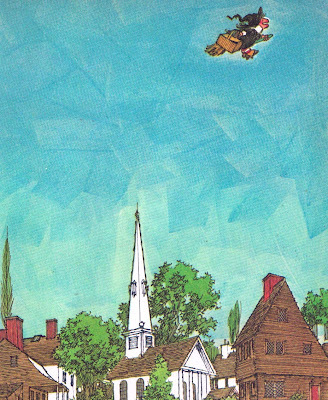 I still have my childhood copy and I blogged about it a few months back. Oh yes I did... sooooo good. Great post by the way! Oh, the Old Witch! My favorite. Do you have the Devlins' "Cranberry Thanksgiving" as well? The brash Mr. Whiskers comes to Thanksgiving dinner and almost gets pegged with stealing Grandmother's coveted cranberry bread recipe (with the secret recipe printed on the back cover, of course). Growing up, my sisters and I received a collection of books and I always thought I was the luckiest to have so many from Parents' Magazine Press. True prizes, each one.